I hope you're all as excited as I am to choose what candidates are going to be on the ballot for probably one of the most important mid-term elections of my lifetime. In addition to gubernatorial and senate candidates, you will also select candidates for Secretary of State and Treasurer. If you are outside of our district, you might also be selecting an Assembly candidate, and in some cases that primary election is essentially the general election because they may run unopposed. I also want to briefly address some concerns that I have discussed with people about hacking and the integrity of our elections. Imagine if every polling place in our country used paper ballots and then subsequently made a scanned image of every ballot cast, along with a report indicating how the votes on the ballot were cast, freely available to the public? That is exactly what Dane County does. In my opinion, this provides an unprecedented amount of transparency. When you click on 'April 2018 Spring Election Ballot Images,' you will be able to download a series of files that are 2 GB each. In these zip files, you will find PDFs ending in one of two characters: 'C' and 'I.' The 'I' is a scan of an actual ballot and the 'C' is how the votes on that ballot were tabulated. Click here to see a 'C' PDF. Now, Click here to see a 'I' PDF. On these ballots, you will see that votes were cast for Dallet, Kloppenburg, Crawford, Remington, Dye, Berz, Stier Christensen, Ruder and 'No' to eliminate the state treasurer. This proves that the votes were all counted accurately. If you wanted to conduct a 'risk limit audit' as described here, you have all the tools to do so and it is all data that is publicly available! I also want to address the express vote machine. The express vote is the best of all worlds: it helps those who are differently abled vote, will print an actual paper ballot of your selections, helps prevent undervotes and erroneous ballots, and allows the clerk to not print ward-specific ballots. Let's dive into a few of these points. When we will vote in the primary, you can't cross-over vote. That means that you can only vote in one party's primary. The express vote machine helps enforce these rules. Also, in some elections, wards have run out of ballots. With an express vote machine, it is harder to run out of ballots since you don't print a specific ballot for a ward. Express vote also facilitates early voting by allowing the libraries and other early-vote locations to accommodate voters from all wards. Imagine the headache if a library had to have ballots for all wards. Technology will inevitably become a bigger part of elections. Express vote allows us to take advantage of technology while preserving paper ballots. If you have any questions, please reach out. If I can't help you, I will put you in touch with someone who can. We recently took a tour of different conservation practices across the County. We typically vote to support these types of projects through cost-sharing agreements but it was great to get a hands-on look of these practices in action. The EANR and Land Conservation meetings were held before the tour in a shelter at Mendota County Park. This was a good launch point, since our first stop was the Clean Beach Treatment System. This is a system where there is an on-site filtration, where dirty water is pumped through the filter and clean water is returned. It creates a clean swimming area for our neighbors to enjoy, and minimizes closings due to bacteria. 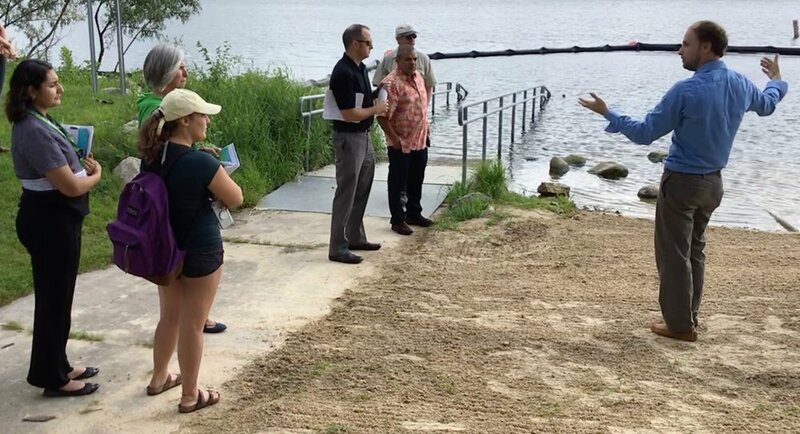 The system is expensive and isn't economically feasible to have at all beaches, but is one of many solutions that we can use to keep our beaches open. We then visited a farmer who was raising about a hundred head of cattle. In the picture, if you look at the top you will see a huge roof over the cows. This roof will prevent rain water from falling directly into the enclosure. When it did, it would wash manure directly into the ditch which was next to a creek directly in the Yahara watershed. This is a project that has a very high return on investment, and keeps mass quantities of manure out of the water. We next saw a harvestable buffer strip. I covered these in more depth in a previous update. The summary is that the county rents land next to streams and waterways in either 5, 10 or 15 year contracts, and this will ensure that a suitable cover crop is planted which will capture sediment, nutrients and pesticides and prevent phosphorous from leaving the farm. Our last stop was a dairy farm that had waste serviced by the Manure Digester that I covered in a previous update. This was a larger feeding operation that stored their feed in trench silos, which are large cement enclosures on the ground rather than in traditional vertical silos. These trench silos will leach concentrated phosphorous as the feed transitions from a greener feed material to a drier, brown feed material. The liquid that leaches from the silos is concentrated enough to wear down the the concrete below. We also wore plastic covers over our shoes. The project at this farm collects this run-off and drains into a cement collection pool. The waste will then be pumped to the manure digester so it can be converted to natural gas and have a large percentage of the phosphorous removed. One of the challenges we have is that these concentrated feeding operations produce lots of waste through not only the manure, but also the feed. The preferred approach would be to have pasture grazing, but that would require large swaths of land. Going forward, I will encourage environmentally friendly practices to raise cattle and produce dairy, but also support programs such as manure digesters that use innovative approaches to handle waste and keep it out of our waterways. We have a number of recommendations from the Healthy Farms, Healthy Lakes task force which cover this in more detail. You can see a number of trench silos here that hold feed for the dairy cows on the farm. the liquid that leaches from these SILOS drains to a collection pool where iT can be processed at the manure digester. notice the stylish plastic boots that tour participants are wearing. We just had another successful AtwoodFest. Thanks to the entire organizing team, SASY neighborhood association, Wil-Mar Center and the Barrymore. Special shout-outs to festival co-chairs Ginny Jenkins and Megan Williamson and volunteer coordinator Dan Lenz. I had a great time volunteering at KidsFest with Allison Werner and was lucky enough to DJ with my daughter Marigold on the KidsFest stage. I look forward to seeing you all at Central Park Sessions, Orton Park Fest, Schenks Corners Block Party and Willy St. Fair!